A classic non-digital "brushstroke" pattern originally developed in France back in the 50's and eventually adopted by nations all over the world. This particular "Lizard" pattern was adopted by the Hellenic (Greek) Army back in the 70's and has served in numerous peacekeeping missions through the Balkans and Europe. Cool and easy-moving, not to mention packed with pockets to keep gear organized on the go. <b>NOTE:</b>Sizes on label may show smaller than advertised but are true to our size charts. 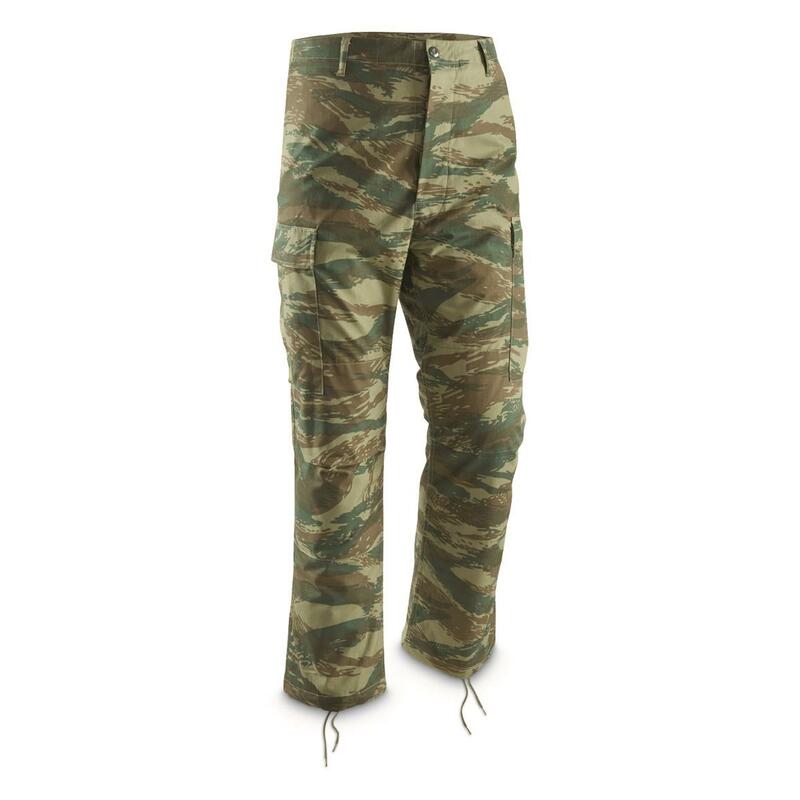 Greek Military Surplus Lizard Camo BDU Pants, New is rated 3.8 out of 5 by 9. 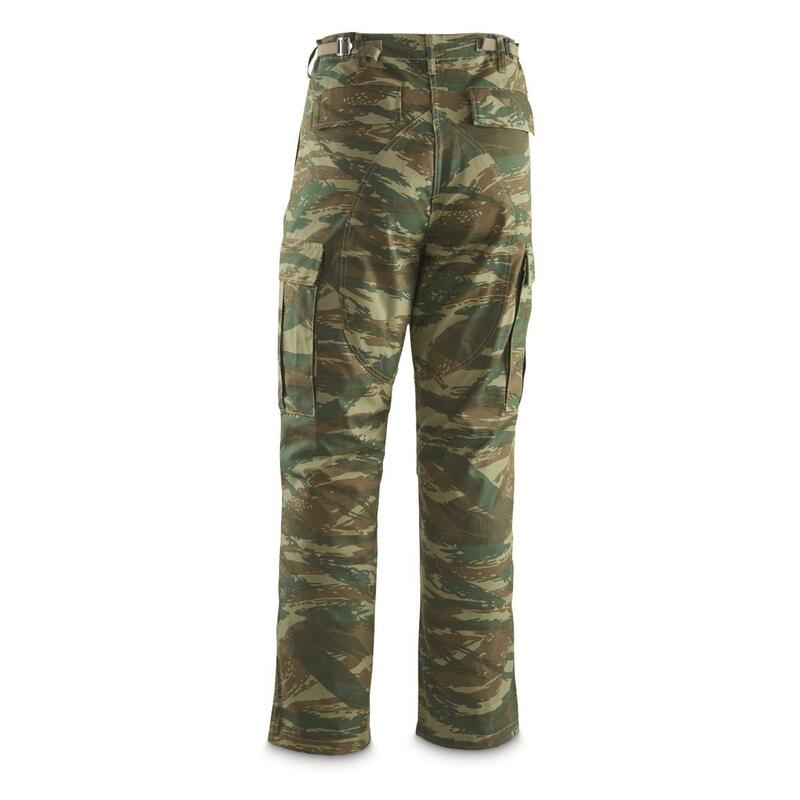 Rated 5 out of 5 by xxxx from This is my first pair of these pants and they fit perfect and have the deepest front pockets I have ever had. Rated 4 out of 5 by RonB from Great price but button fly. Great price and fit. Note, these are button fly not zipper.This was not mentioned in the description. Rated 5 out of 5 by Mike from Good Fit, Great Pattern These are good looking brushstroke camouflage and comfortable for warm weather. They're well made and fit true to size-- the medium are about a 34" waist, max. Rated 3 out of 5 by Harv from Questionable quality The size guideline is correct, with the pants being a true medium. The tag has some Greek lettering and I saw no indication of Chinese manufacture. The rip-stop is a smaller grid, but no problem there. I washed the pants prior to wearing and the left rear belt loop came loose on the bottom. There were no loose threads, and there seemed to be glue residue on the body of the pants. I will try a quick stitch to resolve the issue, instead of an exchange.I have not had any issues with SG in the past and am a regular customer. The pattern is very interesting and I look forward to years of good wear. Rated 3 out of 5 by slobodan from runs small these pants would've been great . . . . . . if they were the right size. Rated 5 out of 5 by Appalachian trail blazer from Excellent buy. Good quality. I'm 33x30 and the medium fit perfectly. Legs are roomy but not bagy. Material is perfect thickness for spring, summer or fall wearing. No complaints whatsoever. Rated 4 out of 5 by BK Noonan from Nice Fit Well-made pants in a heavier ripstop material. I'm 6'4, 200 and the Large is a near-perfect fit. Comfortable. Pattern looks good for spring hunting in the Southeast. No Greek tags or markings anywhere, so I doubt they're genuine surplus.